If you managed to negotiate part one of the be-your-own-pony-book-hero exam, here is part 2.
a. The livery yard owner warns you against going anywhere near the horse. So you don’t. b. You creep up to the yard in the dead of night and sneak into the evil stallion’s box to lay soft hands on his neck. You know the two of you have a special connection. c. After much struggle, you and you alone rescue the evil stallion, but it will take you at least 12 books before you have any sort of connection. d. The evil stallion is to be put down as he is Beyond Saving. You and your friends come up with a cunning plan to save him. I would have to be manacled to my desk to keep me from going to see this, but I wonder how Spielberg has dealt with the fact it's the horse who is the narrator, as it's not immediately apparent from the trailer. Maybe that's deliberate? Hodder and Stoughton have done a glam re-issue of Mary Stewart's books (at last). I like these. They're the right side of glamorous, without being annoyingly and self-consciously "vintage". All Stewart's heroines had those tiny waists, as well of course as oodles of inner strength and resourcefulness. 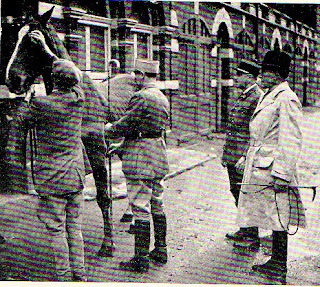 And for those wondering if I can go a whole entire blog post without mentioning the horse, she did of course write the Lipizzaner adventure Airs Above the Ground. If you fancy winning the title of your choice from the re-issues (and I do) go on over to the Brown Paper blog, where you can enter a giveaway to win the Mary Stewart of your choice. I've gone for The Crystal Cave, which I can remember getting out of the library and lugging to school. Daughter has gone off to do her latest GCSE science module exams today, with our big question of the day being "Can you resit a resit?" Answer comes there none. For those of us for whom the exam season is a thankfully far distant memory, but who yearn to share their offspring's pain, or revisit their revision-strewn youth, here is an entrance exam to the world of the pony book. A. What part should poetry play in the fully rounded pony book hero’s life? 1. You quote poetry in a dashing way as you sweep around the countryside on your pony – you thrill to the way the cadence of the words matches the rhythm of your pony’s movement. 2. You have learned by heart John Betjeman's Hunter Trials, and that will do nicely, thank you very much. 3. What is poetry? B. You have gone to visit a cousin. She thoughtfully puts out a selection of literature on the bedside table for you. What would your ideal selection be? b. not switch off brain when the tv advertisements come on. Last week we had a bee swarm. A few days ago my daughter came in and said that we had bees flying around the north wall of the house, which I took I must admit not a lot of notice of, as we always have a lot of bees about. Those bees have now taken advantage of our complete failure to do anything about our dodgy pointing and made themselves at home in the wall. "Don't forget that buying this book means my Jack Russells get their supper!" And I have wondered over the years exactly how the industrial booksellers work. There is one similarity between us that might not occur to you straightaway: central heating obviously isn't an issue in the warehouse, and it doesn't tend to be much here either so I can sympathise with the workers in their coats. I haven't posted for some days this week for family reasons. The next few days' posts are all ones I've written in advance, and then scheduled over the next few days. It's highly likely I won't be able to respond to any comments, so I apologise in advance. I am not ignoring you. in the world of racing silks, notoriously one where patterns are of a strictly plain variety; the spot and the stripe holding sway. Racing for Change ran a competition recently for students at Central St Martin's, in which the brief was to design revolutionary new colours. Henry Griffin it was who won it, with fruit machine designs, and his colours will appear in all their glory at the first race at Ascot on 9th July. I think we can probably consider ourselves blessed that Cath Kidston designs aren't "vibrant and easily identifiable", otherwise I bet some owner would make an essay at those. One of the useful things about Blogger is the stats. Below is the list of my most popular posts. I'm slightly depressed by the fact that my two most popular reviews by far are the ones in which I have spread myself somewhat on the book's failings. It is much easier to be snarky, I find, than to write a really good, positive review. The position of War Horse (which is a positive review) in the stats is more likely to be because of its current mighty popularity as a play. The one post whose position in the top five really mystifies me is The Way Things Were: Pony Magazine in the 1960s, which is a look back at riding clothes adverts and the beauties of the 1960s jodphur. The stats aren't precise enough for me to work out quite how people find that post, but I'd love to know why it's stayed so popular. If I were a more devoted historian I would do a much longer post on this, but this is a quick skim sort of post. Recently I was shown this conveyance, in which Richard Goodwin, yeoman, appears to be selling most of the village of Irchester to Thomas Ekins, of Chester (which in this case I think refers to nearby Chester House, not Chester in Cheshire). Whether or not this conveyance includes our house and the land that was once associated with it is debatable. The document mentions "All that messuage or tenement lying next the churchyard in Irchester..." We do know that the farm once stretched down to the Wellingborough Road, which would certainly include the land mentioned above. We haven't traced the ownership of the house as far back as 1698, which is when the document is dated, but Richard Goodwin and Thomas Ekins look like possible owners, though it's more likely that Thomas Ekins owned the house rather than lived in it himself. I was in Birmingham last weekend, sitting in a garden, when I heard a terrible wailing from the street outside. The people I was with were vaguely irritated, but not at all alarmed. They saw my puzzled face, and explained the noise was the trumpet the rag and bone man blew. He was a regular, and not a popular, visitor. He had a van, not a horse. Maybe that was where he was going wrong. There was recent article in the Daily Express which extolled the benefits of the resurgent rag and bone man with horse; the horse apparently encouraging people to recycle in France. Maybe someone should give Mr Birmingham Rag-and-Bone a copy of the article. Charm might be the way to go. Thanks to Rosemary Hall for telling me about this. I blogged earlier about World Horse Welfare's plans to round up a herd of semi-feral horses in Scotland. Here's what happened. Thank you to Orion for sending me these books. I haven't read any of the Tilly's Pony Tails series since the first one, and the series has been growing apace since then, with 3 more titles due this year. The series is about heroine Tilly Redbrow, who "lives, breathes and dreams" horses. She has a special way of communicating with horses: she knows what they're feeling. The series is about Tilly's adventures with her own horse, Magic, and the horses who go through the Silver Shoes Stables. I'm not quick at going with new technological developments, I must admit. My mobile is of the strictly pared down variety. It telephones. It texts. And that's about it. Oh, and I can play Sudoku on it as well. However, if you have a more advanced phone my blog now has a mobile version, so you should be able to read it on your phone easily. If you do happen to look at this blog on your mobile, I'd love to know if you think it works OK.
Or maybe not. Michael Gove has suggested that children should be reading 50 books a year. Being prescriptive about it is tricky. I have two children, both of whom were read to every day, both of whom were taken to libraries and book shops (often these were secondhand bookshops, where I used to park them with a Beano album while I searched the shelves), have a house full of books and bookish parents. One reads endlessly. One doesn't. I've managed to survive as a profit-making bookseller for some years now, but not without the odd self-inflicted wound. Of course I may well be inflicting others on myself even as I write, but I haven't yet realised what they are. Paradise House sees K M Peyton sticking to the historical novel genre she's followed for the last few years. Aimed at a younger readership than her Small Gains series, this story is set in (I think) Victorian England, with all the social constrictions that that implies. People moved in stratified social circles, but the one thing common to all was the horror of illegitimacy. Alice, the 11 year old heroine of the novel, is, it turns out, illegitimate. When the novel opens she is living a life of cloistered strictness. No one appears to like her much; she has no friends apart from Robin, the groom's son. Her father is remote and unfeeling. Her mother died when Alice was little. Here's a round up of the pony book releases I know about for June. The next two in Babette Cole’s Fetlock Hall series are out in June. Penny Simms continues her adventures at boarding school Fetlocks Hall, fighting against the evil Devilpeds. 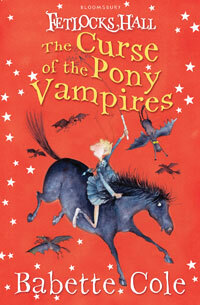 Vampires finally make their way into a pony book in The Curse of the Pony Vampires. It was only a matter of time. Bloomsbury Publishing, £5.99. Andersen Publishing have the next Follyfoot episode out this month. £4.99. The next Jinny re-issue is out this month, as Catnip continue their lovely series of reprints. £5.99. The 12th in the Pony Club Secrets series is due out this month. This lengthy series is nearing completion now. HarperCollins, £5.99. If you work in the retail trade, the customer whose connection with the real world is iffy at best will not be news to you. Jen Campbell works in a bookshop, and she writes here about some of her more memorable customers. Reining - is this abuse? Craig Schmersal is a member of the USA Reining Team. He (and other reiners) were recently filmed by Epona TV. Have a look at Susannah Forrest's post setting out what went on. Thank you to Faber for sending me a copy of this book. 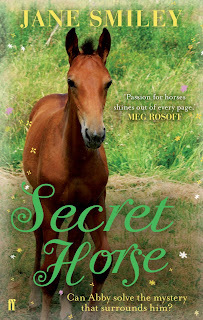 Secret Horse is the sequel to Nobody’s Horse, which I reviewed last year. I have wondered for a while now who nabbed ponybooks.com, and now I know. Angela Dorsey, author of a couple of lengthy pony series for Stabenfeldt, has branched out into publishing. As well producing her own books, Enchanted Pony Books is looking to publish new work. So, aspiring pony book authors, this might be your chance.